As you may know from our links on facebook, Denise and I decided to indulge in the Mystery Gift Box promotion beauty baron (+ elf) were having! We have decided to do a collective haul since we each got some stuff thanks to this promotion! I received 3 orders together and the other order two days after. The first order I opened included the Daily Brush Cleaner (which I re-ordered) and the new Make Up Lock and Set and Mascara Primer + Mystery Box Number 1! Second Order I opened which included 2 Make Up Mist and Set (one re ordered and another one for my bf's mum), Cream Eyeliner in Black (re order) and All over covering stick in Honey (re order but different colour since they didn't have Rosy Beige (fyi tried it and it matched with my skin tone)) + Mystery Box Number 2! After two days of waiting Order number 3 arrived!!!!! This order included all new products since I wanted to try new things, the HD powder is the only reorder in this order. So I ordered the tone correcting concealer in Rosy beige, the new lengthening and defining mascara, and two natural radiance blushers one in shy and the other in coy + Mystery Box number 3! On to the part I know you all have been waiting for, the Mystery Boxes!! I received the New Beauty Book the Natural Eye edition and three nail polishes in Twinkle, Glitter Glam and Smoky Brown. I loved this Mystery box not only since I love the Beauty encyclopedias/ books but because the only product I had was Smoky Brown! The second Mystery Box included a Beauty Book, the Smoky eye edition, the new Smudge Brush, Nail file kit and a nail polish in Golden Goddess. This is probably my favourite out of all the three Mystery boxes since there is a diversity of products plus I only have the Golden Goddess Nail polish. Funnily enough this mystery box is identical to the one my friend Lara received! It includes two nail polishes one in Smoky Brown and Twinkle which are doubles since I received them in the other Mystery Boxes and I already had Smoky brown, a mineral eyeshadow in outdoorsy (I LOVE IT and I usually hate green eyeshadow) and a bamboo lip brush! I hope you liked my part of the haul! If you would like me to review something please comment below! Also, please tell me if you liked the photo resolution since I took all the photos with my new phone! Anyways. This order was quite small. 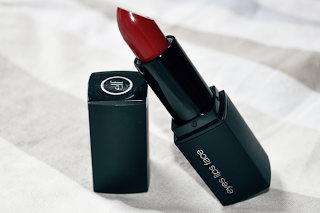 I bought a mineral lipstick in Cheerful Cherry, which I absolutely LOVE, and the new mineral Personal Blend foundation in Medium. 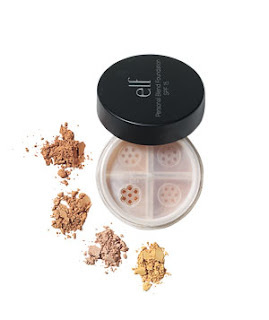 The product comes out little by little . . so of course, takes ages to apply full face. . . The smoky brown nail polish is my own..because I gave the one I received to a friend that was with me when I open the parcel . .
We hope you enjoyed this post!! What a nice sunny day!! The weather today inspired my Nail Of The Day ! Will show you a picture at the end of this post. This one is really pigmented!! But for a better colour, I still apply a second coat. This one is not very pigmented. I only put 2 coats on the picture, but I would probably put a 3rd coat next time. .
Altough the 1st coat is not pigmented, by the 2nd coat, the colour is totally transformed!! I'm obsessed with my nails!! I always make sure they are nicely filed. I apply cuticle oil everytime I remember, so to keep nails healthy, and I make sure my nail polish is neat and not chipped. Among nail polishes I like, are by E.L.F (from http://www.crueltyfreemalta.com/ or http://www.eyeslipsface.co.uk/) and also by Rimmel. In other nail polishes, consistency is thich or takes ages to dry!! I was at a beauty salon the other day, and the Golden Rose stand attracted me to it. Such beautiful colours!! I bought a bright red one, because I didn't have a bright red one in my nail polish collection. I love this polish!! The consistency is perfect, not too thin and not too thick. It dries super fast!! The only downside is that this one in particular is quite small . . but there are other nai lpolishes by the same brand. This is what it says on the box : A specially designed treatment for headaches which is applied directly to the forehead for fast, effective headache relief without pills. Contains 100% Levomenthol w/w . It does exaclty what it says!! I really soothed my headache plus it was not greasy and no one could tell I had something on my forehead .. :) I highly recommend it!! Personally, whether it's summer or winter, I want my hands and feet to look gorgeous!! It does take a little effort, but it's worth it!! Do you struggle to keep your hands looking good? Truth is, women you know with really nice hands probably do one thing extra that maybe you don't - they give their hands a little extra attention. Take a few minutes to apply a hand cream with an SPF, and you'll instantly have softer hands while avoiding age spots down the line!! Your poor hands are exposed to UV everyday, and because there is very little fat density around the back of the hands, they very quickly show the signs of age. The ideal nail length is also the easiest to manage. Short, trimmed and filed to the length of your finger tips, with gently rounded corners. Don't file the sides. File nails to prevent breaking or splitting. Nails are made up of several fine layers, so no matter how good your nails, if you let them grow continually, the weakened ends will split as layers start to separate. Mix 4 tbsp each of honey and brown sugar, and 3 to 4 drops of essential oil (I like lavender). Massage on to hands. Leave on for about 15 minutes then rinse. 1. Start by filing your nails into a neat, short length. 2. Condition your cuticles, either by warming some almond or olive oil in water and soaking your finger tips for 4-5 minutes, or using a scrub ( like the ones above! - or try OmOils Calming body polish - Eur 14.85 from www.crueltyfreemalta.com) Massage your hand and also the cuticle area. Let the treatment soak soak into the skin and rinse off. 3. Gently push cuticles back, now that they are softened.Remember, skin is elastic, so a nourishing cuticle treatment will make the skin more supple. Use circular motion to gently pick the cuticle up off the nail bed. 4. Massage in cuticle cream or oil, then take a cotton pad soaked in polish remover and wipe over the nail. This is called 'squeaking', this primes nails before polish! Hope all is well! This morning, I went out for some shopping! I had to first go to Shanti in Mosta to buy asafoetida and ended up buying some discounted goodies.You may also find Weleda and other cruelty free products on www.crueltyfreemalta.com !! - Are free from synthetic fragrances , colours, preservatives. - Are NOT tested on animals. Plus : raw materials are derived from mineral oils. The 100ml bottle is made out of glass ( I never bought a body lotion in a glass bottle). It's not bigger than the palm of my hand. It came in a packaging box. Silky Weleda Wild Rose Body Lotion pampers the skin with natural moisturising ingredients, keeping the oil and water content of the skin's own protective fine outer layer in natural balance. This light lotion allows the skin to breathe, maintaining a smooth and supple appearance.The delicate fragrance from essential oil of Damask Rose , soothes and harmonises. 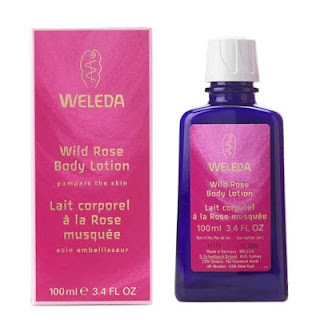 Weleda Wild Rose body lotion is ideal for moisturising body care and is suitable for all skin types. The natural ingredients help support the body's own moisture regulation and gently tones the skin. Roseship oil from Wild Musk Roses contains unsaturated fatty acids, and together with moisturising jojoba oil, provides replenishing skin care, leaving your skin looking fresh and healthy. The lotion, with it's like silky consistency, is fully absorbed by the skin. Ingredients: Water (Aqua), Simmondsia Chinensis (Jojoba) Seed Oil, Alcohol, Glycerin, Rosa Moschata (Rosehip) Seed Oil, Glyceryl Stearate SE, Glyceryl Linoleate, Calendula Officinalis Extract, Butyrospermum Parkii (Shea Butter), Fragrance (Parfum)*, Rosa Damascena (Rose) Flower Oil, Limonene*, Linalool*, Citronellol*, Benzyl Alcohol*, Geraniol*, Citral*, Eugenol*, Farnesol*, Hamamelis Virginiana (Witch Hazel) Distillate, Beeswax (Cera Flava), Sodium Beeswax, Magnesium Aluminum Silicate, Chondrus Crispus (Carrageenan), Xanthan Gum. After bathing or showering, dry the skin well and apply Wild Rose Body Lotion to your body. They are true to their word!! The lotion smells absolutely amazing and is absorbed by the skin quickly! Would definitely recommend it !! This 30 ml tube also comes in a box. An intensive cream to moisture and protect the face from environmental damage. Formulated to stimulate natural moisture regulation and supports the functions of the skin. Organic jojoba oil, pure beeswax and biodynamic Iris Germanica root extract soften the skin, while natural essential oils revitalise and provide a delicate fragrance. 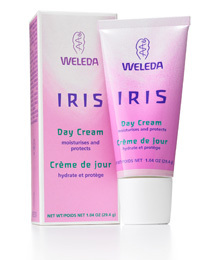 Iris day cream is also an ideal base for make-up. I loved that the consistency is not thick. My skin feels so smooth and needless to say, smells amazing!!! I also recommend this for!! This is for normal to dry. Another for oily skin is available. This 30 ml glass spray deodorant doesn't come in a box. A light floral fragrance provides a feeling of freshness and well being, whilst herbal extracts neutralise bacteria and prevent unpleasant body odour. It can be used as an all over body spray. A pump-action spray to counteract unpleasant body odours without inhibiting the important functions of the skin. Free from aluminium salts, this fine spray dries within seconds leaving no stickiness. Contains Wild Rose Leaf extract, known for it's refreshing and mildly astringent properties. Ingredients: Alcohol, Water (Aqua), Fragrance (Parfum:)*, Limonene*, Linalool*, Citronellol*, Benzyl Alcohol*, Benzyl Benzoate*, Benzyl Salicylat*, Geranoil*, Citral*, Eugenol*, Farnesol*, Rose Moschata Leaf Extract, Rose Damascena Extract, Glycerin, Ammonium Glycyrrhizate. Apply after showering or bathing ashttp://www.blogger.com/post-edit.g?blogID=5588549982560616202&postID=7628123394572909509 often as necessary. For most people one application lasts all day. Do not spray in the direction of the eyes or mucous membranes. The bottles, with their spray diffusers make good plant sprays when empty. It's absorbed by the skin easily, and doesn't leave skin all liquid-y like some other sprays. Love it! So I ended up buying those 3 produts from Shanti, besides the asafoetida - oh, I also bought a packet of organic millet flakes. Moving on to Shana!! I bough 2 tops from the Birkirkara outlet. There's also a smaller shop in Rahal Gdid. - Long comfy top : As soon as I saw it, I pictured me wearing it with leggings. So comortable. Also available in other colours. Leggings from Accessorize, boots from New Look. I took my new favourite vegetarian cook book (Kitchen of Love - Dada Shantimaya) with me in the car so I can see which dessert too cook. I decided to make the banana cake!! I love bananas!! First, pre-heat oven to 180 degrees. In a bowl, combine flour , baking soda and salt. Don't forget to sift flour! In a separate bowl, whisk together sugar and oil.Then add the bananas.Add water and vanilla. My mum mashing the bananas --> The mixture after adding vanilla and water. Now, add the flour mixture to the second mixture and stir. That's all for today ! Please leave your comments below!! Anyways this is not an earring collection post (but I will do one if you want!) but a haul from Aphrodite's Temptations! Aphrodite's Temptations is owned by the lovely Annette who sells really original jewellery on face book! My story starts here I had liked the face book page a while ago and a few days ago Annette posted that she had the last pair of a set of earrings. I commented on the photo and bam the earrings were mine!!! Earrings Set 2, they also came in the cute packaging! The second pair of earrings is still available for sale from here! Please note I had come from work and took these photos so I am not looking my best hehe!